Incarnation of Our Lord Church at 5th Street and Lindley Avenue, Philadelphia. 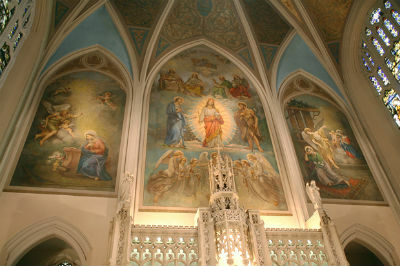 An interior view of Incarnation Church shows its ornate sanctuary. Three Catholic churches that had operated as worship sites after merging with neighboring parishes will be closed, the archdiocese of Philadelphia announced Sunday, June 14. 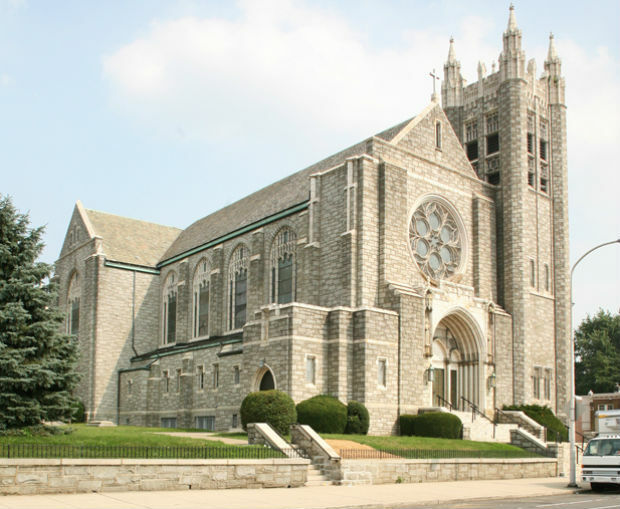 Incarnation of Our Lord Church in Philadelphia’s Olney section, Holy Saviour Church in Linwood, Delaware County and Our Mother Sorrows Church in Bridgeport, Montgomery County, will close effective July 15. The church buildings have been designated for “profane but not sordid use,” which according to the archdiocesan statement is a formal term under church law which means they will no longer serve as worship sites. Both Incarnation and Holy Saviour parishes ceased to exist when they merged in 2013 with St. Helena in Philadelphia and St. John Fisher in Boothwyn, respectively. At that time the churches became the responsibility – including all their assets and debts — of the newly merged parishes, according to archdiocesan policy for parish mergers. The pastors of those parishes, along with lay leaders, requested that the worship sites be closed because of their potential financial drain on the parishes. 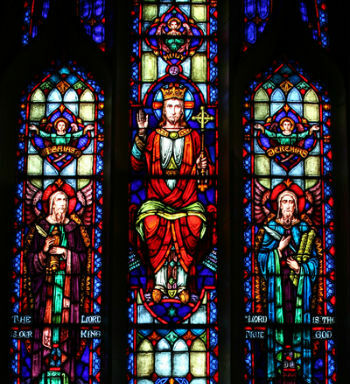 A stained glass window of Incarnation Church. Incarnation’s large, ornate building would require extensive renovations were it to remain in use, according to the archdiocesan statement. The church’s façade needed $625,000 in repairs in 2013, plus repairs to the roof and interior. Those repairs were deemed too expensive for St. Helena Parish to absorb without jeopardizing its ability to continue serving the working class North Philadelphia neighborhood. Incarnation’s name will live on at St. Helena-Incarnation Regional School – part of the Independence Mission School system – at least for the time being. Holy Saviour Church in Linwood had needed $152,000 in repairs four years ago, but the work was never done because the parish lacked the funds. Its merger with St. John Fisher provided no additional ability to fund the repairs, and the deterioration worsened. Now, repairs to the Holy Saviour’s church, rectory and school total more than $600,000. Of the three churches, none is in worse shape than Our Mother of Sorrows in Bridgeport. It has remained “unused for an extended period of time,” the statement said. 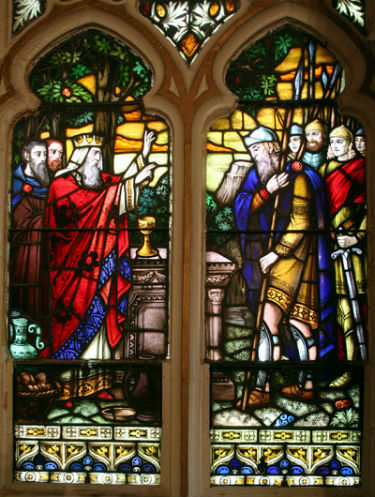 A stained glass window of Holy Saviour Church, Linwood. The former Slovak personal parish closed in 2001, merging with St. Augustine Parish. Responsibility for Our Mother of Sorrows transferred to St. Augustine, then transferred again to Sacred Heart in Swedesburg in 2014 when the two remaining Bridgeport parishes – St. Augustine and Our Lady of Mount Carmel – merged with Sacred Heart. 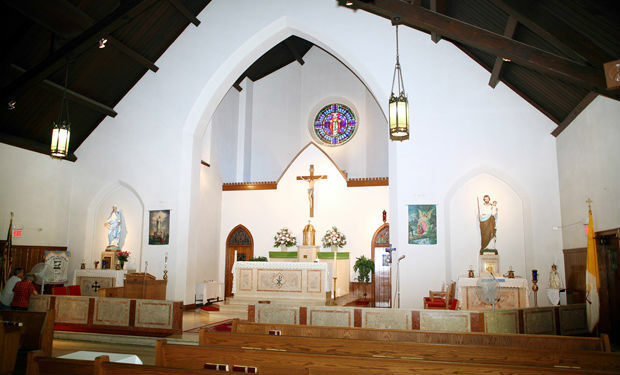 Since Sacred Heart today is responsible for four churches plus their other buildings in the Bridgeport/Swedesburg area, the parish “does not have the financial resources to repair and maintain the Our Mother of Sorrows building,” the statement said. The future disposition of all the closed churches and buildings on their property will be determined by the pastor and pastoral and finance councils of the respective responsible parishes. The hope is to provide for “continued parish viability and sustainability” of those parishes, which means the closed buildings could be sold to support the parish communities. An interior view of Holy Saviour Church, Linwood.